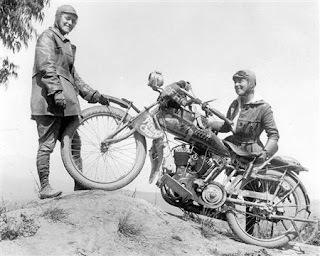 " Women can aid the war effort by darning socks and packing care packages, but they do not belong on motorbikes," a man to Angeline's right loudly declared. "What a ridiculous notion! All the motorcycles would crash, all the women would be killed, and the information would end up in the wrong hands." In the summer of 1916 American women do not have the right to vote, let alone be motorcycle dispatch riders. The Hanson sisters, Angeline and Adelaide, are determined to prove to the world that not only are women capable of riding motorcycles, but they can ride them across the United States. Alone! From a dance hall in Chicago to a jail cell in Dodge City, love and trouble both follow Angeline and Adelaide on the dirt roads across America. The sisters shout their triumph from Pike's Peak only to end up lost in the Salt Lake desert. Will they make it to their goal of Los Angeles or will too many mishaps prevent them from reaching their destination and thus, hinder their desire to prove that women can do it? I very seldom read Young Adult books but I do like historical fiction and particularly historical fiction based on real people who I haven't previously heard of. 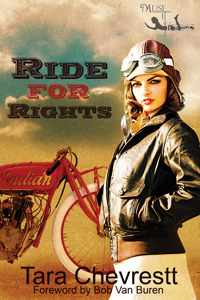 Ride for Rights is a fictionalised account of the Van Buren sisters, Augusta and Adeline, New York society girls who exchanged their fashionable dresses for breeches and leather helmets , took on the challenge of mastering heavy Indian Model F motorcycles and riding them 5000 miles over hazardous roads ......pioneers for Women's Rights. The narrative of the story , interspersed with excerpts from Angeline's diary and contemporary newspaper reports , is fast-paced and has a wonderful 'girls can do anything' energy and I particularly enjoyed the appearances of other well-known names like Amelia Earhart and the Astaires . The author includes explanatory notes at the end which saves any confusion about what is fact and what is fiction. Ride for Rights is the sort of book I read and loved as a young girl and which fostered a lifelong love of historical fiction. It's fun, it's an adventure, it's informative and its heroines are an example of independence and having the courage to follow your dream. This was definitely a good read! It was, Marg - glad you enjoyed it too. The cover is so great -- I just love it! I've seen nothing but great reviews for this one -- I'm so going to have to get it! It is a very eye-catching cover. Hope you'll read and enjoy too! Sounds like a great read and I'm so happy to hear that it is based on real events!